To keep trains running smoothly on the MTR network a wide variety of special maintenance vehicles are used to keep the tracks in top condition. One of these is a rail milling machine. Photo via the MTR Service Update unofficial Facebook page. Since the early 20th century rail grinders have been used to improve the ride of trains using the track. They use grinding wheels to remove metal from the rails, restoring the profile and removing irregularities from worn tracks to extend their life. However the past few years a new technology has become prevalent – rail milling. These machines mill the rail head instead of grinding it, resulting in a more accurate profile and a higher quality processed surface. In June 2015 two new rail milling trains entered service in Hong Kong. 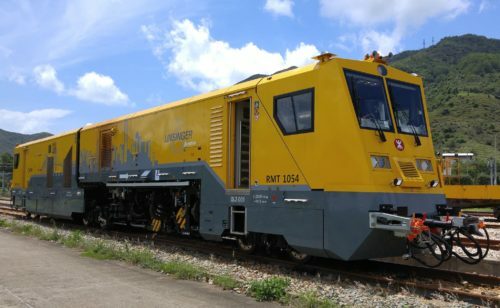 Among the new maintenance vehicles, Dr Lee said the most notable were the two Rail Milling Trains purchased from Austria at a cost of about $72 million each. The new machines offer more advanced milling technology, higher cutting power and higher precision controlling the final profile of tracks. In addition, they need only one pass to finish a rail profile whereas the existing Rail Grinding Machines require five to eight passes. – The RMT it is designed to finish the process in one pass and re-profile 1km of rail in three hours, an over 40% increase in efficiency compared to existing grinding machines. – This frees up more time for other inspection and maintenance works. – More environmentally friendly due to less grinding action and over 90% of removed metal is collected for recycling. The two SF02T-FS machines were supplied by Linsinger of Austria, a leader in rail milling technology, and were specially designed for use on underground rail networks. The Austrian railhead profiling specialist will be unveiling its latest compact SF02T-FS rail milling train at InnoTrans 2014. This is one of a pair that the company is due to deliver to Hong Kong’s MTR Corp in the spring of 2015. The small-profile SF02T-FS has been designed for use on metros and narrow gauge railways, and is able to operate around curves as tight as 50 m radius, thanks to a purpose-developed articulation joint. A low-emission engine facilitates operation in tunnels, as does a cleaning process that ensures that neither milling chips nor grinding dust are left on the track. Similar models have previously been supplied to JR West and Seoul Metro. Around 22 m long and weighing 84 tonnes, the SF02T-FS is carried on 700 mm diameter wheels, with a maximum axleload of 14 tonnes. It is able to travel between worksites at up to 60 km/h, and can cope with gradients as steep as 4%. When operating, the machining speed varies between 5 and 14 m/min, depending on the depth of cut. Power is provided by a 400 kW diesel engine, which supplies two 75 kW motors for the milling heads and two 33 kW grinding units. According to Linsinger, the combination of milling and grinding enables the complete reprofiling of the railhead in one pass. The flexible cutting depth allows material removal of between 0·1 mm and 1·5 mm on the running surface and up to about 3 mm on the gauge corner. This ensures a high degree of accuracy in the longitudinal profile and cross section, as well as a high-quality finish to the rail surface. Because the profiling is done without any high pressure, the company says this avoids any risk of changing the rail’s metallurgical structure. With no dust and sparks flying, the risk of a fire in the tunnel is reduced. Now News took a tour of a newly arrived rail milling train in this Cantonese language TV news report. Early testing of the new machine was carried out in the yard at Tsuen Wan Depot. While this video shows it at work by night on the Tsuen Wan Line main lines. However there were some teething troubles – one of the rail milling trains caught fire while at work on the Tseung Kwan O line. Train service on the Tseung Kwan O MTR line was disrupted for more than two hours on Monday morning after smoke poured out of a rail milling train, triggering its fire alarm. The incident happened shortly before 4.30am, when the HK$72 million train was about 300 metres away from Lohas Park station. After the completion of its track works, the train was connected to a locomotive and was about to be towed back to its depot, according to MTR Corporation head of operations Francis Li Shing-kee. “When the milling train’s generator was turned on, its fire alarm went off,” he said. Maintenance workers informed the MTR control centre and the Fire Services Department. Li said staff tried to fight the blaze with an extinguisher before firefighters arrived. Firefighters put the blaze out with two extinguishers. Using two extinguishers, firefighters put out the fire at 5.20am, according to a government spokeswoman, who added that two teams of firefighters wearing breathing apparatus were also deployed. She said no casualties were reported in the second-alarm fire. Fires in the city are rated on a scale of one to five alarms according to their seriousness. An MTR Corp spokesman said the milling train was slightly damaged and had been towed to its Tseung Kwan O depot for inspection. According to MTR Corp, train service between Lohas Park and Tseung Kwan O stations originally began shortly before 6am, but the incident halted operations for about half an hour. The railway company offered passengers shuttle bus services in the meantime. Over on the MTR Service Update unofficial Facebook page more information about the incident can be found. This entry was posted in Transport and tagged Hong Kong, maintenance, Mass Transit Railway, MTR, rail operations, railway, trains. Bookmark the permalink. I also have an Instagram account (@legit_trainspotter) that focusses mainly on my travels around Hong Kong, and includes quite a few MTR (as the name suggests) pictures as well, although I haven’t been posting much lately due to my studies. Hope this has been of value, and Happy New Year!